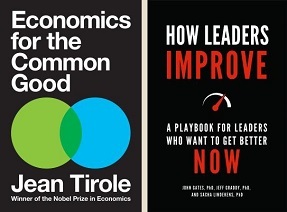 Economics for the common good / Jean Tirole ; translated by Steven Rendall. How leaders improve : a playbook for leaders who want to get better now / John Gates, PhD, Jeff Graddy, PhD, and Sacha Lindekens, PhD. Civilizing torture : an American tradition / W. Fitzhugh Brundage. Deadly justice : a statistical portrait of the death penalty / Frank R. Baumgartner, Marty Davidson, Kaneesha R. Johnson, Arvind Krishnamurthy, Colin P. Wilson. Intellectual disability and the death penalty : current issues and controversies / Marc J. Tassé and John H. Blume. Solitary : the inside story of supermax isolation and how we can abolish it / Terry Allen Kupers. Anni Albers / edited by Ann Coxon, Briony Fer, and Maria Müller-Schareck. Berenice Abbott : a life in photography / Julia Van Haaften. A critical companion to the American stage musical / Elizabeth L. Wollman. México 1900-1950 : Diego Rivera, Frida Kahlo, José Clemente Orozco and the avant-garde / edited by Agustín Arteaga. Parental discretion is advised : the rise of N.W.A and the dawn of gangsta rap / Gerrick Kennedy. Which side are you on? : 20th century American history in 100 protest songs / James Sullivan ; foreword by Reverend Lennox Yearwood and Bill McKibben. A chill in the air : an Italian war diary, 1939-1940 / Iris Origo ; introduction by Lucy Hughes-Hallett ; afterword by Katia Lysy. Americans remember their Civil War / Barbara A. Gannon. An African American and Latinx history of the United States / Paul Ortiz. Code girls : the untold story of the American women code breakers of World War II / Liza Mundy. The long Civil War in the north Georgia mountains : Confederate nationalism, sectionalism, and White supremacy in Bartow County, Georgia / Keith S. Hébert. Nation branding in modern history / edited by Carolin Viktorin, Jessica C.E. Gienow-Hecht, Annika Estner, Marcel K. Will. Race, place, and memory : deep currents in Wilmington, North Carolina / Margaret M. Mulrooney ; foreword by Paul A. Shackel. Seven myths of Africa in world history / by David Northrup. Trauma in first person : diary writing during the Holocaust / Amos Goldberg ; translated from Hebrew by Shmuel Sermoneta-Gertel and Avner Greenberg. The Vietnam War : an intimate history / Geoffrey C. Ward ; based on a documentary film by Ken Burns & Lynn Novick ; with an introduction by Ken Burns and Lynn Novick. War in Val d’Orcia : an Italian war diary, 1943-1944 / Iris Origo ; introduction by Virginia Nicholson. Asheville poetry review. Vol. 25, no.1 = issue 28 (2018) / managing editor, Keith Flynn. The banished immortal : a life of Li Bai (Li Po) / Ha Jin. Indigenous cities : urban Indian fiction and the histories of relocation / Laura M. Furlan. The letters of Sylvia Plath, 2 volumes / edited by Peter K. Steinberg and Karen V. Kukil. Recovering Native American writings in the boarding school press / edited by Jacqueline Emery. Teaching the works of Eudora Welty : twenty-first-century approaches / edited by Mae Miller Claxton and Julia Eichelberger. Telling the stories right : Wendell Berry’s imagination of Port William / edited by Jack R. Baker and Jeffrey Bilbro. 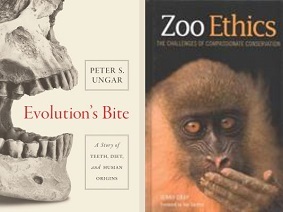 Evolution’s bite : a story of teeth, diet, and human origins / Peter S. Ungar. Zoo ethics : the challenges of compassionate conservation / Jenny Gray ; foreword by Joel Sartore. The embattled vote in America : from the founding to the present / Allan J. Lichtman. The faces of poverty in North Carolina : stories from our invisible citizens / Gene R. Nichol. Grit : the power of passion and perseverance / Angela Duckworth. How change happens : why some social movements succeed while others don’t / Leslie R. Crutchfield. Identity : the demand for dignity and the politics of resentment / Francis Fukuyama. Living without the dead : loss and redemption in a jungle cosmos / Piers Vitebsky. Reading Lacan’s Écrits : from “Signification of the Phallus” to “Metaphor of the subject” / edited by Stijn Vanheule, Derek Hook and Calum Neill. The red and the blue : the 1990s and the birth of political tribalism / Steve Kornacki. Transgender history : the roots of today’s revolution / Susan Stryker. The United States government manual, 2018. We can’t breathe : on black lives, white lies, and the art of survival / Jabari Asim. 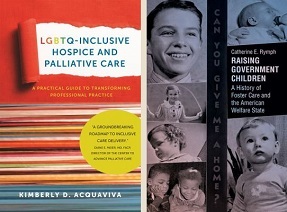 LGBTQ-inclusive hospice and palliative care : a practical guide to transforming professional practice / Kimberly D. Acquaviva. Raising government children : a history of foster care and the American welfare state / Catherine E. Rymph. All that is left is all that matters : stories / Mark Slouka. The book of Aron / Jim Shepard. The buried giant / Kazuo Ishiguro. The darts of Cupid and other stories / Edith Templeton. Four novels of the 1930s / John O’Hara ; Steven Goldleaf, editor. The high mountains of Portugal : a novel / Yann Martel. John Updike : novels, 1959-1965 : The Poorhouse Fair; Rabbit, Run; The Centaur; Of the Farm / Christopher Carduff, editor. Me and my daddy listen to Bob Marley : novellas & stories / Ann Pancake. The news from Spain : seven variations on a love story / Joan Wickersham. The pure gold baby / Margaret Drabble. Unsheltered : a novel / Barbara Kingsolver.